Aliens vs. Predator is a DirectX 11 science fiction first-person shooter video game, developed by Rebellion Developments. Available as a standalone benchmark, on default settings the benchmark uses 1920x1080 with high AF settings. 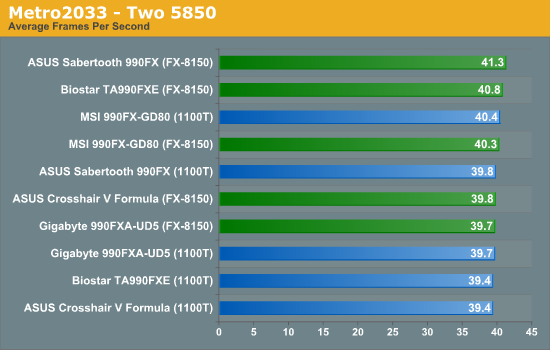 Results are reported as the average frame rate across 4 runs. 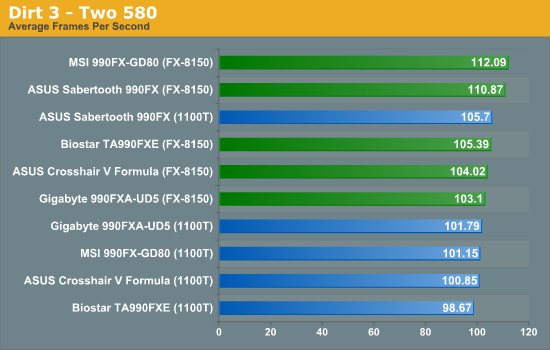 AVP is seemingly a GPU limited benchmark all the way through, with no apparent difference between the processors until you get to the dual 580 usage scenario. However, at 130 FPS, it is unlikely a difference will be spotted. Dirt 3 is a rallying video game and the third in the Dirt series of the Colin McRae Rally series, developed and published by Codemasters. 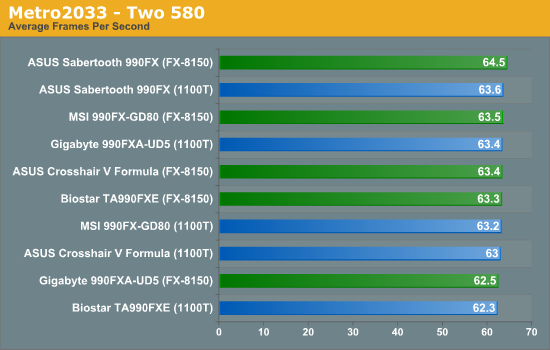 Using the in game benchmark, Dirt 3 is run at 1920x1080 with full graphical settings. 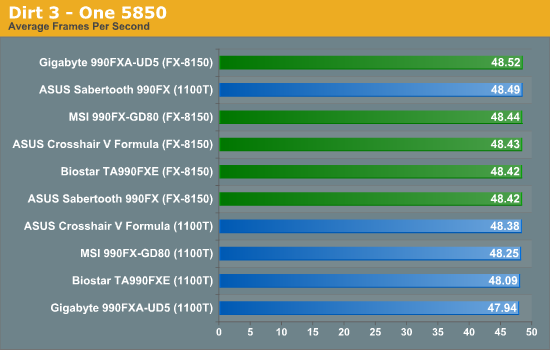 Results are reported as the average frame rate across 4 runs. 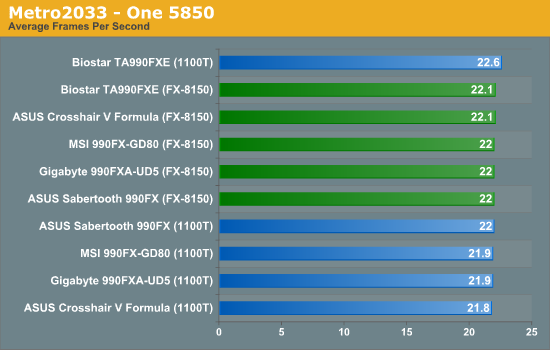 Dirt3 always ends up showing a big difference between boards, as it is all about how well the runs are and how often the motherboard decides to tell the GPU to use more or less cores, or implement turbo states. 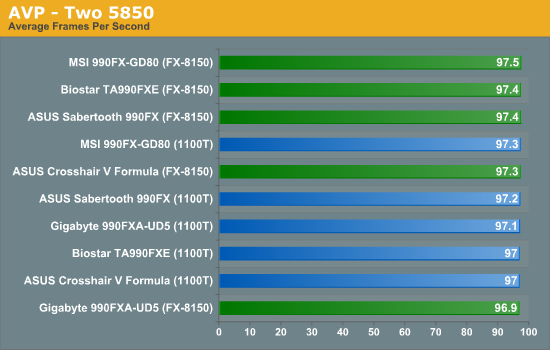 In this case, the FX-8150 tends to reign over the 1100T, but the choice of motherboard at high GPU rates will cause up to a 9 FPS difference. The Sabertooth in this instance comes near the top. Metro 2033 is a challenging DX11 benchmark that challenges every system that tries to run it at any high-end settings. Developed by 4A Games and released in March 2010, we use the inbuilt DirectX 11 Frontline benchmark to test the hardware at 1920x1080 with full graphical settings. 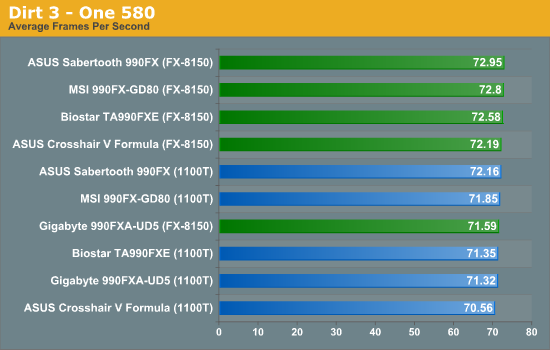 Results are given as the average frame rate from 10 runs. The most demanding benchmark in our suite this time round is Metro2033, requiring a lot of GPU grunt to give even a nice 60 FPS at 1920x1080. 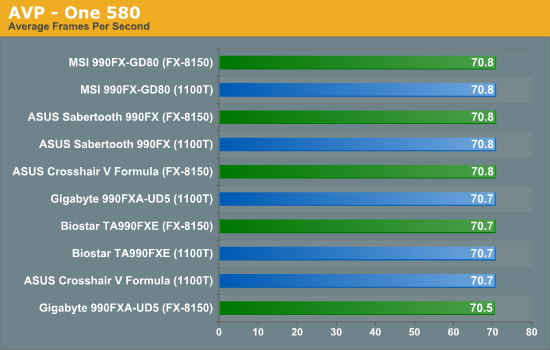 The processor doesn't seem to matter much here, as all our results are within statistical variance. Though the Sabertooth again comes rather near the top most of the time. "The third generation FX processor, codename Steamroller, is still reported (not confirmed) to use AM3+, meaning that there are still quite a few years left in this platform when taking the AMD route." If this is true then i simply cannot believe that AMD will continue on socket AM3+ without a chipset that supports PCIe 3.0! This seems to be an ok roundup of AMD boards. However, how do the latest Windows 7 tweaks increase the performance of the Bulldozer? 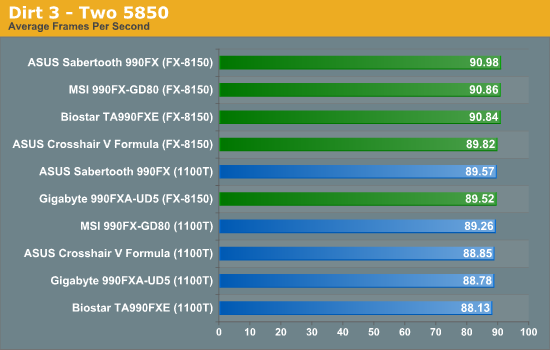 Can we get a before and after benchmark based on Win 7 and or Win 8 (beta) optimizations? If there are any motherboards you would like to see in the future (or particular tests), drop me an email (ian AT anandtech.com) and I will have a look. Obviously I can't take care of every little niche test that everyone wants, otherwise we'd only get one board a month out for review, but I'll do what I can! Temperature related problem have long been rectified in C3 stepping of Denab CPUs and in Thuban as well. There is no fault in temperature sensor anymore in our CPUs. Only C2 rev. or earlier rev. AMD CPUs suffered from this issue. 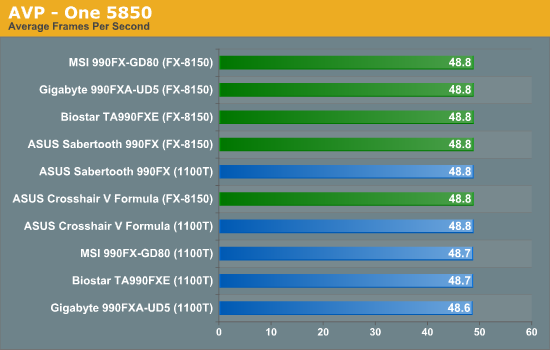 I bought an MSI 990FX-GD80 board a couple of months ago and was looking for a review like this one at the time. 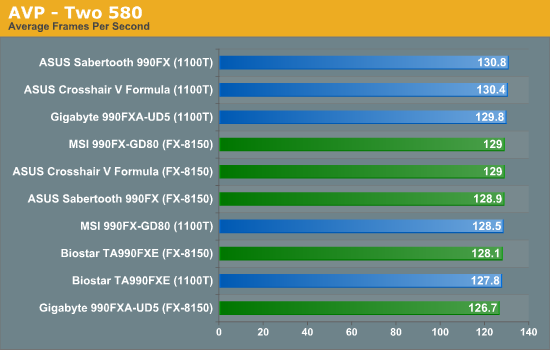 I would have loved the info you brought up here and I hope it will help others looking into the available 990FX boards. I went with the MSI board since it seemed to hit a sweet spot on features, price (newegg was offering $20 off which put it to $169) and performance. I also went with a Zosma processor since it seemed to hit the price elbow and had the most unlocking potential. I've been very happy with the experience thus far. I've been able to unlock the 2 additional processors and have pushed the clock to 3600mhz (stock is 3k). My next push will be to see if I can hit the aggressive clocks listed in this article. Very comprehensive, thank you Ian! 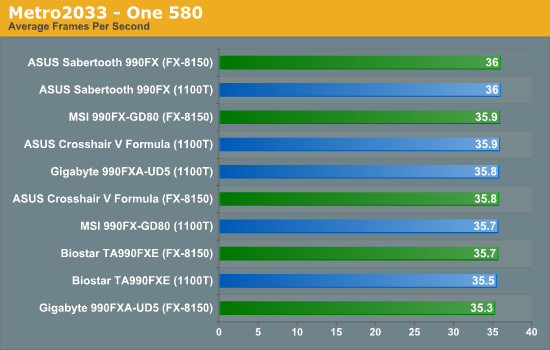 Of course now that you've exhausted so much energy on this review, the 1090FX chipset is right around the corner alongside the 2nd gen FX CPUs.